The Deseret News also publishes a weekly compact-sized insert, the Church News, and the Mormon Times insert, both of which are included in the newspaper (in the Saturday and Thursday editions, respectively); the two inserts are also distributed as a separate publication outside Utah. The Church News includes news of the LDS Church and has been published since 1931,  while the Mormon Times is about "the people, faith and culture associated with the church". Since 1974 the Deseret News has also published the Church Almanac, an annual edition carrying LDS Church facts and statistics edited by Church News staff. 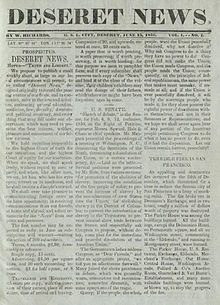 The first issue of the Deseret News was published June 15, 1850, and was 8 pages long. This first issue included the paper's prospectus, written by the editor Willard Richards, along with news from the United States Congress, and a report on the San Francisco 1849 Christmas Eve fire; an event which had occurred six months prior. Because it was meant to be the voice of the State of Deseret, it was called the Deseret News, and its motto was "Truth and Liberty." It was at first a weekly Saturday publication, and published in "pamphlet form" in hopes that readers would have the papers bound into volumes. Subscription rate was $2.50 for six months. 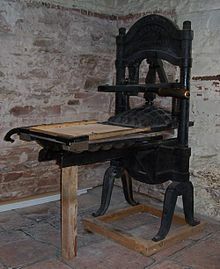 Since its first publication the News had been owned directly by the LDS Church, but as worries about property confiscation increased due to the Morrill Anti-Bigamy Act and Poland Act, and the paper's ownership was transferred to The Deseret News Company after it was incorporated on September 3, 1880. :183 About this same time the News began looking for a location to build a new paper mill, as the Sugar House paper plant was not adequate. A new granite plant was constructed near the mouth of Big Cottonwood Canyon, 13 miles south of the paper's offices. The mill began producing paper in April 1883, and was known as the Cottonwood Paper Mill. The News would sell the paper mill in 1892 to the Granite Paper Mills Company. :199–200 The mill caught fire and was destroyed April 1, 1893. In 1903 the News moved out from its longtime home in the Deseret Store, kitty-corner to a newly constructed building. This was the first time the paper had a building constructed expressly for it. It was designed by Richard K.A. Kletting and built with stone from Mount Nebo in Central Utah. While the building was under-construction a fire destroyed the Oregon Short Line building in Salt Lake City, and the railroad wanted to rent space in the new building. As a result, the News constructed an annex to the west of the new building for more space. :243–244 This new home was at the site of the former Council House; presently the Beneficial Tower (Gateway Tower West) sits at this location. On November 20, 1920, the News began airing nightly wireless news flashes, called the Deseret News-International News Service bulletins. The paper had also formed The Deseret News Wireless Club, with members across the Western United States who would transcribe the radio bulletins and post them in their communities. :269 In April 1922 the paper received a license to officially operate a radio station, with call letters KZN (later changed to KSL). The station's first regular broadcast aired on May 6, 1922 in the form of a talk by then-LDS Church president Heber J. Grant. In 1924 the station was sold to John Cope and his father, F.W. Cope, who formed the Radio Service Corporation of Utah. The LDS Church would later purchase this corporation and go on to create KSL-TV. The News, KSL Radio, and KSL Television continue to remain closely linked. On May 16, 1948 the News would deliver its first Sunday paper. The first Sunday edition contained 154 pages with a new farm, home, and garden section. :339 The Sunday edition would continue into the 1950s, when an agreement with The Salt Lake Tribune would end it. After World War II the Deseret News, The Salt Lake Tribune and the Salt Lake Telegram were all struggling financially, but no more than the Deseret News. In September 1952, the owners of the News (LDS Church) and Tribune ( Thomas Kearns Family) entered into a joint operating agreement (JOA), where each published separate editorial material while sharing printing, advertising and circulation costs. This JOA was the brainchild of Tribune Publisher John F. Fitzpatrick who helped LDS President David O. McKay ensure the continuation of the Deseret News. As its architect, Fitzpatrick knew that this NAC arrangement would also benefit the Tribune. The News stopped Sunday publication; subscribers received a Sunday Tribune instead. The Deseret News also purchased the afternoon Salt Lake Telegram from the Tribune. The Telegram was discontinued, and into the mid-1960s, the paper's nameplate read: The Deseret News and Salt Lake Telegram. The 30-year agreement between the two papers was renewed in 1982, with some changes. The Newspaper Agency Corporation was renamed to MediaOne of Utah in 2007. The joint operating agreement with the Tribune in 1952 had ended the paper's Sunday edition, but when the 30-year-old agreement was up for renewal, it was changed to allow the News to publish a Sunday morning edition and change its Saturday publication from an evening to morning paper. The first Sunday morning edition of the News appeared January 16, 1983, and the paper has published a Sunday edition ever since. As the twentieth century ended, the Deseret News found itself embroiled in a contentious and often public battle with The Salt Lake Tribune, centered around the terms of their joint operating agreement, the desire of the Deseret News to switch from afternoon to morning publication, and ownership changes at the Tribune. 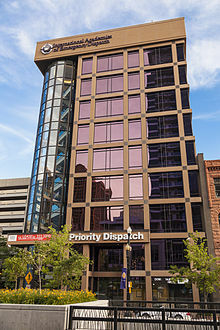 The battle was resolved with the 2000 sale of the Tribune  and with the News switching to morning publication and changing its name on June 9, 2003 to the Deseret Morning News. On January 26, 1995 the News launched the Crossroads Information Network, allowing subscribers to access the News digitally through their dial-up service; digital-only subscriptions were also created. Installation of the Crossroads software—which was mailed on floppy disk to each subscriber beginning in February 1995—was required on each user's computer. The network also allowed users to access the paper's complete text along with archives back to April 1988, the Church News and the LDS Church Almanac. The software allowed subscribers to communicate with each other through an e-mail-like system. Eventually the Crossroads Information Network was shut down and its features were moved to DesNews.com, which itself was replaced with DeseretNews.com. ^ Shelline, James W. (1996). 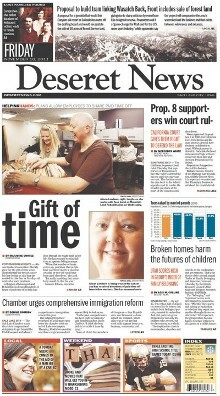 "The Deseret News Web Edition". The Serials Librarian. The Haworth Press, Inc. 29 (3–4): 9–18. doi: 10.1300/J123v29n03_03.